Blue Heron portrait jumps out because of the isolating background. One of the situations I look for when shooting portraits, whether in the wilds or the local park, is an isolating background. I was very lucky here. I had been shooting gulls bathing in a fresh water pond where a creek flowed into the ocean. I noticed in the corner of my eye this Heron in the distance. The overcast light was illuminating him beautifully, but the background was dark from a concrete bridge. What a treat! 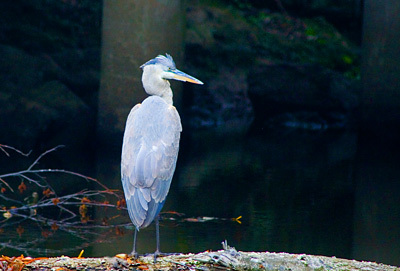 I switched to spot metering mode so I could base my exposure on the heron and not the background, then began shooting. I would capture about 10 frames, move closer a few feet, then shoot another series -- always being respectful of his space. Once I had the shot I wanted, I backed off and let him enjoy the rest of his afternoon. I can't get your RSS feed to work right in google chrome, is it on my end?